I've recently discovered a new stone I love working with... Picasso Marble!Picasso Marble is a stone that is mined in Utah. 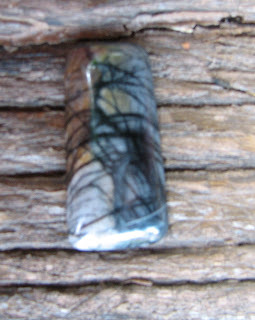 Some call it Picasso Jasper, but it is a marble, not a jasper. Technically it is a metamorphosed limestone occurring in the form of a coarse to medium grained rock of re-crystallized dolomite or calcite.This marble is mined in Utah and no two pieces are ever alike. Been busily working on creating something with this beautiful marble today. I'm not sure I did the piece justice..I like it, but maybe could do better? After much hemming and hawing, I finished. I would love feedback on this piece! Until next time~ Happy Beading! Thanks! I'm trying to decide how best to finish it off as far as a closure and cord length. What a beautiful stone. I love all the black lines criss-crossing over the colors. Hey Lissa - I love your work and your doggie - how sweet! i like the design - with such an interesting stone, keeping the wrap delicate and simple was a great choice. it's lovely! Love the tunes, Lissa!! I think I may change mine so that it can be turned on manually, so the dial up people don't get "bogged" down, LOLOL!